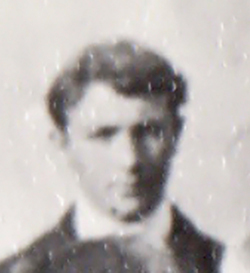 Frederick Robert William John Hitchings' birth was registered during the last quarter of 1896 and he was baptised at St Mary's on 20 December in the same year. Home was the busy bridgekeeper's house at Splatt with his parents, George Frederick Hitchings and Mary Ann Halling, and their large family. His brothers Charles Henry, Ashley Victor and Percival Leonard all served in the war. Fred must have enjoyed his education at school and done well for in July 1910 he was appointed monitor. During the next three years he took annual Cambridge Local Examinations at the Chapter House, Gloucester. His progress earned him a £2 increase in salary to £10 per annum in February 1913 and he was finally rewarded with the appointment of pupil teacher at the school from August the same year. A photograph in our Gallery shows Fred at the school gardening club with the headmaster and some of the boys around 1912. Fred was first posted to the 11th (Reserve) Battalion of the Gloucestershire Regiment, serving in the attestation office at Stroud for a while before he was, quite possibly before seeing action, transferred to the 10th (Service) Battalion of the Lancashire Fusiliers. With the Fusiliers he may have been in action during the Somme campaign of 1916, but would have been at the actions on the Scarpe in early 1917, part of the major Battles of Arras. On 12 May 1917 the 10th Battalion were at Gavrelle, mounting an attack as part of a drive to take the village of Rouex, when they became involved in what was described as 'a terrible bayonet and fist fight in German-held trenches'. Their casualties amounted to 13 officers and 226 soldiers, one of whom was Frederick Robert William John Hitchings. The news took some time to reach Frampton and it was not until 15 June that the headmaster wrote in the school logbook, recording his personal sadness at Frederick's death and remarking that he was the best pupil teacher he had ever trained. Fred had, apparently, enlisted for purely patriotic reasons despite being so close to achieving his dream of becoming a teacher which could have exempted him from service. Corporal Frederick Hitchings was posthumously awarded the British War Medal and Victory Medal. His ultimate sacrifice is commemorated on Frampton's war memorial and the plaque in the village hall, and also on the CWGC Memorial at Faubourg d'Amiens Cemetery, Arras, where his rank is recorded as Lance Serjeant.